Chekhov only just qualifies as a 20th Century dramatist, having died in 1904, soon after the first production of Cherry Orchard, his last play. But with Ibsen, Brecht and Beckett he set the ground rules for 20th Century drama. One influential contribution was his way of looking at society as a whole through the microcosm of domestic life. His plays (like his unsurpassed short stories) reflect great social changes by depicting their effects on the lives of ordinary people, whom he portrays with great psychological insight. Like life itself, his work is characteristically tragi-comic, alternating in equal measure between humour and pathos, setting one against the other. He was not active politically, but he was deeply concerned with people and their lives. By the same token, though he was not a formal worshipper, his search for the spiritual shows clearly in his work. 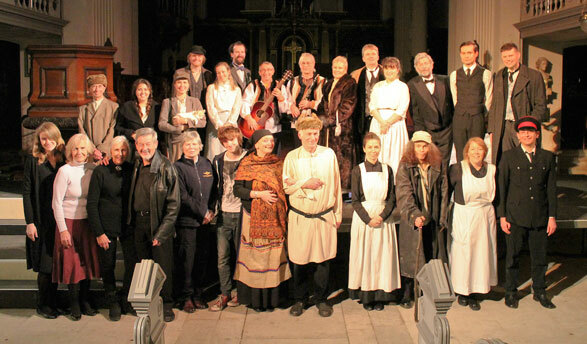 Cherry Orchard reflects two related social changes in 19th Century Russia. One of these was political revolution. Since the abortive Decembrist coup in 1825, revolution against the oppressive Tsarist regime had been an urgent topic of debate. Russian progressives, like Trofimov in the play, were eagerly aware of revolution in Western Europe and anticipated such changes in Russia. The other was economic reform. As if to head off the crisis that was to come, Tsar Alexander II began to replace the old, exploitative feudal system with modern capitalism. One aspect of this was the Emancipation, which ended centuries of serfdom. This was double edged – some former serfs, like Lopakhin in the play, were able to make a lot of money. Most others (and Firs in the play is aware of this) merely found one kind of exploitation replaced by another. For Chekhov, rural Russia was the scene of these changes. He was born in 1860 near the Sea of Azov, in rural southern Russia, a world which often appears in his writing. He travelled in Western Europe and throughout Russia, including Siberia, settling finally in Yalta by the Black Sea. However, he is particularly associated with Moscow, with the newly-formed Moscow Art Theatre and with its director Konstantin Stanislavsky. It was here that Chekhov`s plays were performed, along with those of other pioneering Russian dramatists like Gogol (Government Inspector) and Turgenev (Month in the Country). Though Chekhov saw Cherry Orchard as a satirical comedy, Stanislavsky, to Chekhov`s distress, insisted it was a tragedy. He imbued it with a slow, elegiac moodiness, which established a received wisdom about how Chekhov plays should be performed. The story is that in the Moscow Art Theatre production the last act of Cherry Orchard took 40 minutes. Chekhov wanted it done in twelve! Either way, it is generally accepted as Chekhov`s greatest play. `How difficult it was for me to write`, he said. The play is set, around 1900, in south-west Russia, on the country estate of Madame Lyubov Ranyevskaya. She has just returned after five years in Paris to confront a crisis. The family fortunes are waning and the estate, with its historic orchard and its poignant family memories, may have to be sold to pay the debts. Lopakhin, a former serf now made rich, advises how to develop the estate to avoid bankruptcy. But indecision rules. The family, their household and their friends are confused by the social changes and the new challenges they bring, both to their ways of life and to their personal relationships. What to do with the estate, whether to stay or to go, whom to love, or be loved by, or whether even to love at all – these questions all demand answers. Some of them are answered by the end of the play, though it would be wrong to call this a resolution. Chekhov is open-ended – his plays allow us a glimpse into people`s lives, which still continue after we have stopped observing them. As Chekhov insisted, the play is a comedy, though like all good comedies, it has deeply poignant moments. It has energy, humour, much lively movement, music and dance, numerous entrances and exits which border on the farcical – as well as its moments of near-tragedy. Hampstead Parish Church is a unique space, which lends itself fully to an imaginative spatial treatment of such a lively and dynamic play. 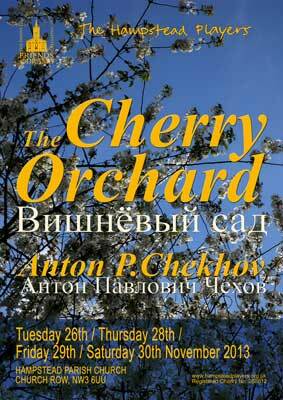 We will present our version of The Cherry Orchard on 26th, 28th, 29th and 30th November, in Hampstead Parish Church. `Cheerful Chekhov` We are also doing a double bill of Chekhov`s comic plays, as a kind of curtain-raiser to The Cherry Orchard. A lively cast will do rehearsed readings of his two best-known vaudevilles: The Bear and The Proposal. Chekhov himself deprecated these little pot-boilers, but they were immediately received with great acclaim. Chekhov wonderingly described their first-night audience as being `in the seventh heaven of delight`. On seeing The Bear, even his critical and severe father admitted `what a wonderful thing you have written`, and there is no doubt that the germ of his mature dramatic technique is present in these early essays in comedic writing. We will present them at 1pm on Wednesday 16th October, in one of our monthly `Literary Hours` at Hampstead Parish Church. Admission is free and there is a retiring collection in aid of the Church fabric fund.